I was a little afraid of how this recipe would turn out. I’ve never really made anything like it before, but it turned out pretty good. It’s very mild, but you could add a little garlic or some extra spices to kick it up. Place one cup of the chicken broth and the basil in a blender. Blend until smooth. Add beans and Parmesan and blend again until smooth. Heat olive oil in large saucepan over medium heat. Add scallops. Cook on each side until golden brown – 2- 4 minutes per side depending on the size of the scallops. Remove scallops, and drain on paper towel. Remove oil from pan. Place pan back over heat and add the second cup of broth. Add pesto mixture. Bring to a boil and cook a few minutes to reduce the sauce. The sauce will be very thin, but will thicken a little as it cools. Place spaghetti squash in bowls. Pour sauce over squash. 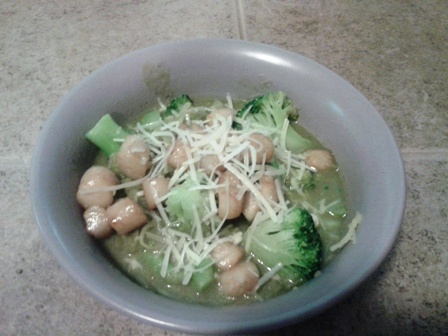 Top with broccoli and scallops. Garnish with Parmesan if desired.